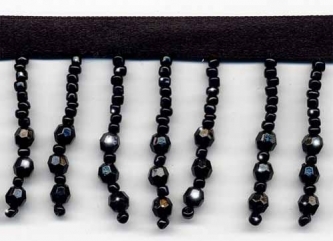 From our Unique Beaded Fringe Collection (trims under 1 1/2" long)This is an elegant beaded fringe trim that is perfect for evening wear or home decor. Absolutely black and perfect - just like the perfect little black dress. Exceptional detail and craftsmanship with high quality sparkling opaque black beads. This beaded fringe trimming is 1 1/2 " long not including the 3/8" " black satin ribbon.